Part of the allure of tabletop gaming is its physicality - being surrounded by friends and playing with tangible, physical tools. 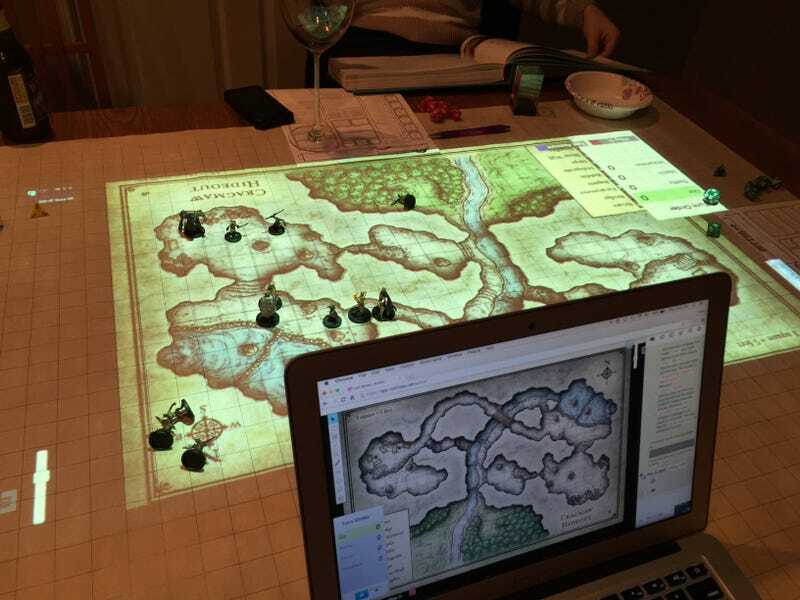 But that doesn't mean you can't use technology to make your gaming sessions a little easier, like this awesome projected map set up by Redditor Silverlight. Silverlight - who works on the digital tabletop software Roll20 - hooked his macbook up to a digital projecter positioned over his gaming table, where he laid out a blank set of grids to project his maps onto, creating a reusable surface to display a variety of locations for his friends to place their physical miniatures on as they played. He could even alter what parts of the map were projected, so his party could only have the line of sight on what they could actually see around them. I love these clever integrations of tech into the traditional tabletop format. It's like having the best of both worlds!